What does it say about teacher training for SEND? 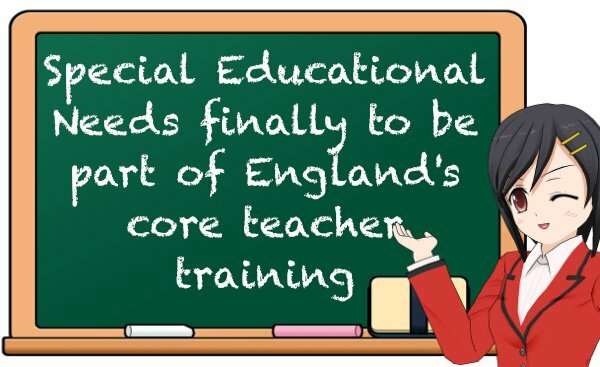 The biggest news for our SEND community is that autism and teaching children with special needs will be a core part of Initial Teacher Training. About time too - you simply cannot state in the SEND Code of Practice that every teacher is a teacher of children with special educational needs and not give them the necessary training to succeed at it. The detail, such as it is, says that providers should ensure trainee teachers understand they are obliged to set high standards to inspire, motivate and challenge ALL pupils for whom they have responsibility. "This applies regardless of age, ability or aptitude, and includes pupils who might have special educational needs and disabilities (SEND), and pupils for whom English is an additional language (EAL). Providers should equip trainees to be able to inspire and provide extra challenge for the most able pupils." "Providers should ensure that trainees are equipped to identify the needs of all pupils, avoiding labelling by group, and make provision for them, including seeking the advice of colleagues with specialist knowledge and experience." equip trainees to analyse the strengths and needs of all pupils effectively, ensuring that they have an understanding of cognitive, social, emotional, physical and mental health factors that can inhibit or enhance pupils’ education. ensure that trainees understand the principles of the SEND Code of Practice, are confident working with the four broad areas of need it identifies, and are able to adapt teaching strategies to ensure that pupils with SEND (including, but not limited to, autism, dyslexia, attention deficit hyperactivity disorder (ADHD), sensory impairment or speech, and language and communication needs (SLCN)) can access and progress within the curriculum. cycle or 'graduated approach' in the classroom. This should involve assessing pupil need, planning, reviewing and implementing change to support pupil progress, as referenced in the Code of Practice. emphasise the importance of emotional development such as attachment issues and mental health on pupils’ performance, supporting trainees to recognise typical child and adolescent development, and to respond to atypical development. “The new framework will mean that, for the first time, every new teacher in England should have a basic understanding of autism and the different ways it can affect students. This is fantastic news for the autism community and will make a huge difference to the lives and prospects of generations of children on the autism spectrum. “Children on the autism spectrum often share certain difficulties, such as struggling to understand unwritten social rules and managing change, but it affects each individual differently. Around 70% go to mainstream schools, so teachers are bound to work with autistic students at various points in their career. Yet, until now, there hasn’t been a requirement for new teachers to learn about autism. ....We’re also calling for the governments of Northern Ireland, Scotland and Wales to follow suit. Every teacher deserves the right training, and every autistic child needs a teacher who understands them"
Three Rs of the behaviour curriculum. The Carter Review highlighted how new teachers felt ill-equipped to teach or manage the often challenging behaviour of children with SEND. One of this week's three publications is Developing behaviour management content for initial teacher training. highlighting the "Three Rs of the behaviour curriculum." Routines: classroom routines as a fundamental source of high expectation, a scaffold for conduct, and a community vision of optimal habits and behaviours. Responses: strategies and interventions for de-escalating confrontation, resolving conflict, redirecting unproductive (or destructive) behaviours, and reacting to antisocial behaviour in a just, productive and proportional way. These include formal interventions (for example: consequences described by the school behaviour policy) and informal ones (for example: verbal/ non-verbal cues, body language). Relationships: regulating one’s own emotional state; understanding personal triggers in one’s own behaviour, expectations or reactions; how special educational needs and disability (SEND) affects behaviour. Understanding for example: attention deficit hyperactivity disorder (ADHD), autism, dyslexia, Asperger’s; the basic psychology of: motivation; long and short term memory; concentration; learning; cognitive load, spacing and interleaving; group dynamics. These are very vital skills for teachers to acquire and the lack of them can often lead to low expectations of children with these conditions, children being turned off learning because they can't understand the way it a subject is being taught and, at worst, exclusion both temporary and permanent. "We have developed the mentor standards based on the evidence we gathered which are set out in four separate but related areas: personal qualities; teaching; professionalism; and self-development and working in partnership. We have also considered how the standards could be used by mentors, aspiring mentors and ITT providers"
The DfE accepted the core content recommendations and will also strengthen continuous professional development a new Standard, published in July 2016. It also accepted the report on professional standards for ITT mentors. "While we endorse the approaches and methods outlined in the behaviour management report and strongly expect ITT providers to take account of these recommendations, the Government does not wish to make them mandatory. "The behaviour management content developed by this group is, of course, an integral part of the framework of core content for ITT. It should be noted that, ....providers will need to demonstrate that their programmes conform to the behaviour management content that is included in the wider framework. "We recognise that there is rarely one standard delivery method that will work in every classroom, and it would be wrong for Government to try to impose a “one size fits all” approach to behaviour management. Rather, all ITT providers should consider what is being suggested in the report and decide how the approaches outlined can best be incorporated into their programmes." This reminds me somewhat of where the SEND Code of Practice has fallen down, by leaving too much to be developed by individual providers, rather than having mandatory standards that must be lived up to and inspected by Ofsted, which will only have a role to play in the other two areas of core content and mentors. So let's just hope that all these ITT training providers are as expert, forward-thinking and committed to recognising best practice for SEND behaviour management as the government believes them to be. Your thoughts, as ever, are welcomed on these developments. Do you think it will make a difference for new teachers? What kind of Continuous Professional Development for existing teachers will be needed to improve the experience of children with SEND? Let us know in the blog comments below. This is great news, but I’m still concerned that it’s framed in terms of teaching, rather than understanding the problems underpinning learning difficulties. My son’s (already excellent) mainstream infant school gave up trying to get S&LT for their children and got the local S&LT service to train the staff instead. All staff can now use Makaton and are trained in the basics of S&LT. OTs, physios and mental health specialists could do the same. I think this is the only way to get the relevant understanding and skills out to all teachers and support staff quickly and effectively. Totally agree with the concerns over leaving interpretations to be different in different counties, that’s the postcode lottery all over again and doesn’t make sense. It is right to applaud this step of making autism and special needs an integral part of ITT though. We’ve asked for it for long enough. Am pleased to say that our county is also rolling out a programme of AET training for all schools in our county; it’s as important, if not more so, to reach those teachers already out there who didn’t have any of this training. We live and breathe autism/SEN but for many teachers it’s a novelty still so this is a good place to start. Hiya, I am writing my dissertation on the impact of the diagnosis of dyslexia on educational achievement and well – being, do you know if SEN training has been implemented into core teacher training yet or is it still an on-going process? I cannot find any current agendas online surrounding the implementation of SEN training into ITT and the ITT criteria itself doesn’t state anything obvious in the most current version 2017. My granddaughter has dyslexia. This is my reality. I am her Special Guardian (kinship foster carer). The primary school wouldnt recognise dyslexia, apparently it doesnt exist accoridng to the headmaster and he definately would pay for a dyslexia test to diagnose it, even from her pupil premium plus. They never accept that the primary carer knows best, the school were always in the right and concerns fell on deaf ears, despite me working well with them, it was often hugely frustrating. They would not accept it being genetic as both her Mum and Dad have it and her Mum was diagnosed at age 19. It causes a host of bullying issues too. I pushed for tests as early as reception but was told she is too young and may grow out of her sensory issues and mirror writing. She didnt. I pushed for more tests, she had 2 x TASS which had information for further reading on dyslexia and her results and the recommendations provided to school were not carried through. Finally in Oct 2015 they put her forward for a speech and language assessment and the recommendations were often not consistently followed through. She was in year 5 separated from her peers and made to sit in corner of room facing the wall. The tutor often ignored her and ‘gave up’ he said as she was hard to teach and he had 36 other pupils in his class to consider, so she got left behind along with about 5 others with learning difficulties. Because they dont get on the SEN register at primary school they dont get specialist early intervention and a different style of teaching, so go through the entire primary education being failed by a system (or specific teachers/schools) and their attainment appears to be about 2 years behind. The school blamed the Bracknell Local Authority, (the Ed Psych to be specific) saying they wont diagnose dyslexia as its too costly for the LA(at approx £500 per child) and it ‘labels’ the children….but then the required early intervention is not forthcoming, in fact no specialist help. She was excluded for 2 days, they said she was lazy, could do it if she put her mind to it and was disobedient as she ran frustrated out of classrooms when they refused to help her and just told her to get on with it. They never listened to her. The SENCO left and the role was passed around unqualified teachers and TAs for a while. The school had no SEN policy/code, no trained SEN, etc.., and her academic studies remained approx 1.5/2 years behind throughout her 7 years there. They put her in year group below for 2 years…which then affected her social skills…but somehow it was all her fault and they spoke negatively about her around her and in front of her. Upon careful choice of secondary school, the secondary school have tested her, put her on SEN register, and her English reading and writing and spelling have come on leaps and bounds. They also cannot fund a test as it falls under same LA. Bizarre as British Dyslexia Assossiation Head Office is in Bracknell! BDA said something is being rolled out to schools for earlier testing, but its early days…..called DIY Profiler…..will have to wait and see. She will probably have left school by then.